In this study we are concerned with the general problem of choosing from a set of endangered species T a subset S of k species to protect as a priority. Here, the interest to protect the species of S is assessed by the resulting expected phylogenetic diversity (ePD) of the set T, a widely used criterion for measuring the expected amount of evolutionary history associated with T. We consider that the survival of the protected species is assured and, on the contrary, that there is a risk of extinction for the unprotected species. The problem is easy to solve by a greedy type method if the extinction probabilities of the unprotected species are known but these probabilities are generally not easy to quantify. We show in this note that the choice of the precise values attributed to the extinction probabilities—provided it respects the rank of imperilment of each species—is not as decisive as might be feared for the considered problem. The values of these probabilities have a clear impact on the selection of the species to be protected but a little impact on the resulting ePD. More precisely, if T 1 and T 2 are the two optimal subsets of species corresponding to two scenarios (two different sets of probabilities) the ePDs of T 1 and T 2, calculated with the probabilities of the first scenario—or with the probabilities of the second scenario—are not very different. 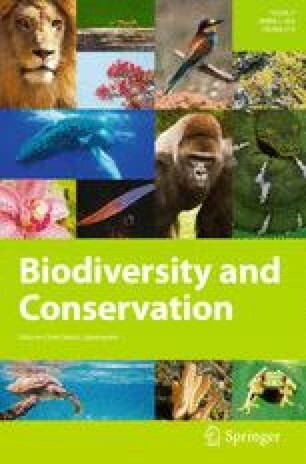 This article belongs to the Topical Collection: Biodiversity protection and reserves.